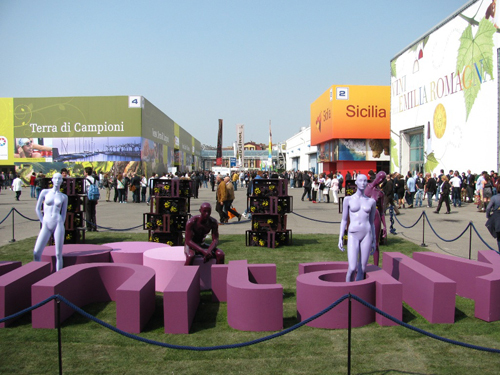 This year marks the 44th edition of Vinitaly, the largest wine expo in the world with over 4,200 exhibitors here to present their wines. Here in Verona, the weather is beautiful and sunny, a welcome change from the typical rainy 5-day event. Perhaps the change in weather is a symbol for the change in attitude of the winemakers from “how to survive the crisis” to “looking toward the future.” Yes, there are a lot of smaller wineries up for sale here and around the world at the moment, but others with their eyes forward are planning their futures, strategically. With a more precise plan of attack this year, and armed with a newly acquired press pass, the event from the outside looked much more manageable this year. That was, until I left the blue sky and sunshine and stepped through the door of the first pavilion. The instant change left me feeling like Alice in Wonderland, so I got my bearings and quickly made my way to the stand of Iris Vignetti where I was met with the friendliest of greetings and a glass of bubbly from my friend Isabella Spagnolo. Her beautifully presented line of Prosecco is the perfect start to fun and adventure. Let the tastings begin! Just like discovering the centuries-old treasures of Italian cities, like the famous Roman arena at the heart of Verona, Southern Italian wineries are presenting and releasing some treasures that many would believe had been lost to time. The news that peaked my interest first about this year’s Vinitaly is the presentation of older wines from Sicily and Campania. Reading this in California, you may wonder why it is such a big deal to talk about, say, 10 year old wines. Well, it’s not if you are talking about a barrique-aged Taurasi from Campania, commonly referred to as the Barolo of the South. But when you are talking about 10-year-old white wines, or when you are talking about the much hotter climate in Sicily for example, this is big news. What it means is that the wineries are making great wine, with healthy grapes, properly using and expressing the terroir, or territorio as they call it here. This is a great sign for those who are tired of the all-too-common comments of wine critics who think southern Italian wineries do not produce with enough consistency yet to be competitors in the worldwide market. It is also great news for those looking to discover a new favorite in an agreeable price bracket. My first official stop was Mastroberardino, where they are excitedly launching their newest line, “Vintage” and an Aglianico Cru made from clones of 100+ year-old vines. The new Vintage line is a very exciting project for many reasons. The wines being presented are a 2002 Greco di Tufo DOC, one of Campania’s great whites, and a 1998 Aglianico IGT. Before even tasting the wines it is important to recognize that only a winery which takes great interest in the territorio, and takes great care of the grapes, both on and off the vine can produce a wine that is fresh and enjoyable after eight or ten years in the bottle, especially when made with the intention of drinking as opposed to ageing. The 2002 Greco di Tufo is an eyebrow-raiser when mentioned to restaurateurs, and the first sip brings a smile of amazement. That is because this eight-year-old white wine, aged only in stainless steel, not oak, is still fresh, layered, and with a complexity that reveals everything about the land where the grapes are grown. The presence of minerality and a balance of acidity make this wine one to enjoy with complex and savory fish dishes where a simple white might get lost or fall flat. Coming from California, I wondered what was really the big deal about a 12-year-old Aglianico, but what I learned is that this wine was made as an every-day wine, as opposed to a Taurasi; simply as an aglianico, not aged for years in barriques, but only 12 months in larger barrels. The result is a complex, flavorful wine with aromas of tobacco and cherries soaked in spirits. Not an aged wine that needs excuses, this vintage Aglianico is ready to drink and enjoy; the flavor is still fresh with ripe cherries and I can imagine enjoying it sip by sip with roast lamb and rosemary potatoes on a long cold evening. Switching from older wines to older vines, I am introduced to the new Aglianico Cru crafted from a new biotype of Campania’s flagship red grape. What’s old is the biotype: vines that survived the phylloxera attack in the late 1800’s because the soil and locality were not ideal environments for the pest to thrive, as agronomist Antonio Dente explained. It is important to know that the wine is produced not from the ancient vines themselves, but from the clone of this older biotype, planted in idyllic Aglianico territorio at the estate in Mirabella Eclano. 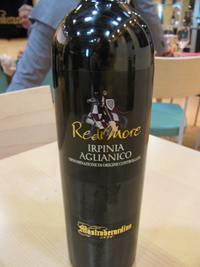 This is where history meets innovation: the result is the 2008 Redimore Irpinia Aglianico DOC, with its playful label showing a king on a horse with a chalice in hand. I was surprised taking my first sip of this wine because I am used to the strong tannins of the Taurasis, but Massimo Di Renzo, the winemaker at Mastroberardino explained that this particular type of Aglianico was used 100 years ago by the local population to make an every-day drinking wine. This explains the lovely roundness of the wine, balanced and flavorful, which I found to be a very enjoyable expression of the grape. For those of you who have shied away from bold Taurasi in the past, this single-vineyard cru is worth trying. From Mastroberardino, I headed off to the conference rooms for a much-anticipated tasting, “Sicilian Wines Challenging Time, Vintage 2000.” The organizer, Chronache di Gusto, was very enthusiastic about the top producers of Sicily presenting their 10-year-old vintages and shared his hopes of the wines becoming ambassadors of the beauty of Sicily. As mentioned previously, these wines were not necessarily produced for ageing, so it is big news to share them with press and critics. 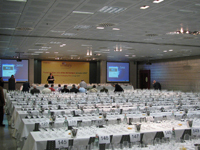 Most of the 180 tasting stations were filled which is a good sign that more people are watching the work being done in Southern Italy, as I believe they should be. 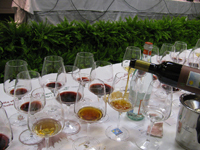 Of the twelve wines, one was white, eight were red and three were Marsala and passito dessert wines. 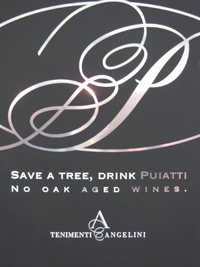 We started off with Planeta’s Chardonnay, and the winemaker Alessio Planeta commented about the need to make durable wines, and in fact had written in his notes that this wine would age for six to eight years, so he was pleased to see it drink so well at ten. With aromas of tobacco and cooked pineapple, the optimum pairing for a wine like this would be a rich saffron or truffle risotto. My two favorites of the reds were the Barocco Cerasuolo di Vittoria DOC from Ragusa, an area called the “Mesopotamia of the Romans” and the Bordeaux-style Ceuso Custera from Trapani. Avide’s Barocco Cerasuolo di Vittoria, made from 60% Nero d’Avola, the flagship red grape of Sicily, and 40% Frapatto for structure, with its deep blood red color is normally sold 6 years after harvest, so it was probably the most prepared for this tasting. With earthy-woody aromas and flavors of pomegranate and blackberry, this wine will best complement tasty, savory courses. The Ceuso Custera, presented by Ceuso Azienda Agricola is made from an international blend of 50% Nero d’Avola, 30% Cabernet Sauvignon for structure and 20% Merlot for smoothness. This was the freshest tasting of all the wines presented, which wasn’t surprising considering the use of Cabernet and the ageing that takes place before the bottle leaves the winery; first in cement casks, then wood, then in the bottle. The aroma and taste is of ripe cherries and black currants and maybe I have been away from California for too long because I am longing for steak. Though there are opposing views about looking to the past to see the future, I believe the Sicily and Mastroberardino tastings proved that if we look at what these southern Italian wineries were doing ten years ago, we can be sure of a bright and delicious future and more treasures to come. These wineries have definite plans and are crafting wines for the competitive international market. My definite plan after the tasting was to find a quick panino which to me can never be considered simply fast food because the bread is so artisan-delicious and the prosciutto is always just-cut fresh. Then to the Foreign Trade VIP lounge to discretely brush my teeth and lose that purple tinge. The secret? Brushing with baking soda leaves your mouth clean and with the mineral-salt finish, ready to enjoy the next wine. I should send that one in to Martha…tips for the all-day wine taster. Brandy lives and teaches in Italy, writing and studying about wine along the way. 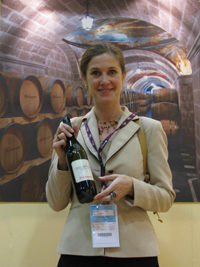 Based in Naples, she covers the Southern Italian wine scene and has been interviewed many times in the Italian media and presented stories to selected publications and TV.